SOFIA, Bulgaria — Thousands of people participated in a grand funeral service Friday for Patriarch Maxim, who led the Bulgarian Orthodox Church for a record 41 years that witnessed the collapse of communism and an institutional schism. Maxim died at age 98 on Tuesday due to heart failure. His funeral drew religious and political leaders, as well as ordinary Bulgarians who recalled him fondly. The patriarch’s body, covered by a gold-embroidered cloth, lay in the center of Sofia’s main Alexander Nevsky Cathedral, while white-robed church elders led funeral prayers under the solemn sound of bells. 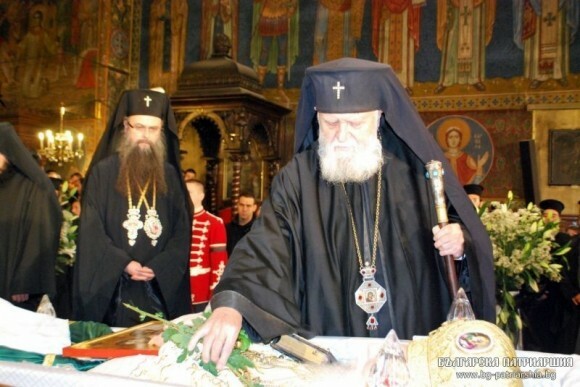 Istanbul-based Ecumenical Patriarch Bartholomew I, the spiritual leader of world’s Orthodox Christians, led a liturgy, while Bulgarian President Rosen Plevneliev praised Maxim for his efforts to unify his church in times of trouble. The latter was referring to the schism in the Bulgarian Orthodox Church after the collapse of communism in the country in 1989 — a split that tested Maxim’s leadership. Back then, the new democratic government wanted to replace communist-appointed church figureheads, including the patriarch. But because of the official separation of church and state, the decision on who should serve as church leaders was left to the church itself. That led to a quarrel between supporters of Patriarch Maxim and breakaway clergymen, who attempted to oust him and then formed their own synod. For more than a decade, the two synods existed side by side. The schism ended in 2010, when the rival synod was dissolved. “His death has united us,” Antonov said. Also among the attendees at the service was Mustafa Hadji, a spiritual leader of Bulgaria’s Muslims, who make up some 12 percent of the country’s 7.4 million people. “Maxim was a good Christian and wise leader who will be remembered by all Bulgarians,” Hadji said. The Orthodox Church leader largely stayed out of the political scene, though he was considered an influential figure throughout his career. He was hailed for meeting with Pope John Paul II during the late pontiff’s visit to Sofia in 2002, a trip seen as warming the frosty relationship between the Orthodox Church and the Vatican. In a condolence letter, Pope Benedict XVI expressed thanks “for the good relations that the patriarch developed with the Roman Catholic Church,” along with hope that they would continue. Maxim was buried later Friday at the Troyan Monastery near the village of Oreshak where he was born.